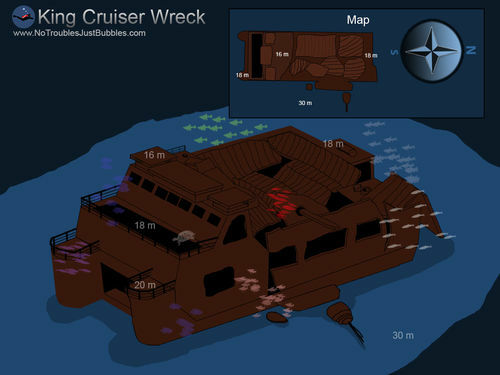 Diving King Cruiser Wreck in Phuket changes every year. How did the King Cruiser become a wreck? In 1997 the boat was being used to ferry passengers back and forth from Phuket to Phi Phi. It was designed as a car ferry, but there are no roads on Phi Phi, so for these journeys only passengers were on board. En route in May 1997 the captain managed to sail way off course and straight into the well-known and map-chartered Anemone Reef. Rumour has it that this was deliberate, but we will never know. Nobody died in the accident, but an old lady suffered serious injuries, including a broken back. How big and how deep is King Cruiser? Can it be penetrated? It is 85 metres long and until recently its shallowest parts were less than 10 metres from the surface. However, in recent years the peripheral parts have broken away, meaning its shallowest parts are at around 16 metres. At its deepest, divers can explore around 33 metres, depending on the tide. In the past, there were several areas to penetrate, but nowadays it has become almost impossible. What can divers expect to see there? The marine life at King Cruiser Wreck is extremely abundant. Lots of schooling fish live here, as well as predators which come to visit. Sightings of large and special species, such as Whale Sharks and Manta Rays are not common, but not unheard of. 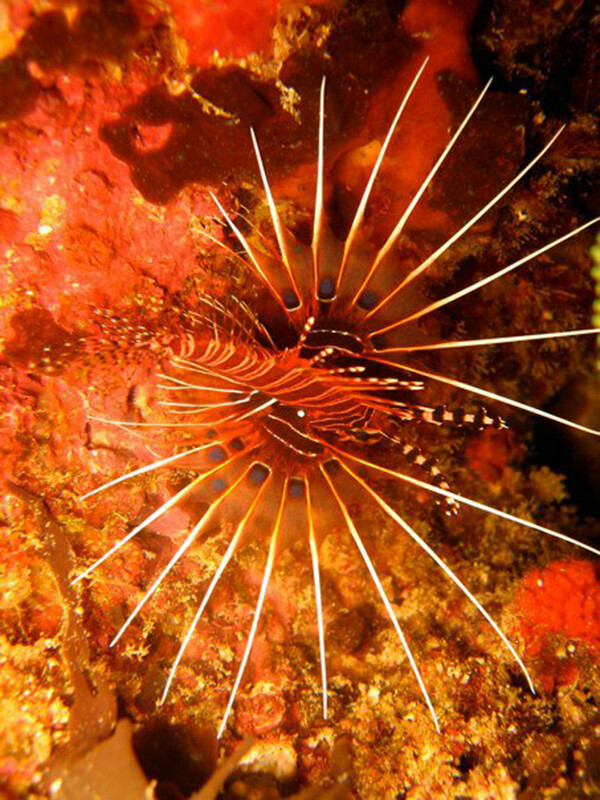 There are lots of Sea Urchins, Lionfish and Scorpionfish to look out for but in general, it’s a fantastic dive site if the sea conditions are ok.
Currents can be an issue, but with several other good dive sites in the area it’s easy to change the order of dives for the day. Visibility is not usually great, but there is lots to see close-up. Surface waves can be a small problem sometimes, but divers here are normally experienced and the boats that visit employ experienced guides and tour leaders. There are two mooring lines. NDL times need to be carefully monitored due to most of the dive being at depth, and then up to a safety stop. Boat traffic means that surfacing divers need to be aware, and the use of SMBs is highly recommended.